Sometimes called star fruit, carambola (Averrhoa carambola) is a tropical broadleaf evergreen tree prized for its unusual fruit, which have a star-like shape when sliced. Carambola trees are fussy about their growing conditions and require moderate upkeep year-round to produce their characteristic fruit. However, their attractive, branching trunk and leathery, 6- to 10-inch-long leaves make them worth the effort for their ornamental properties alone. 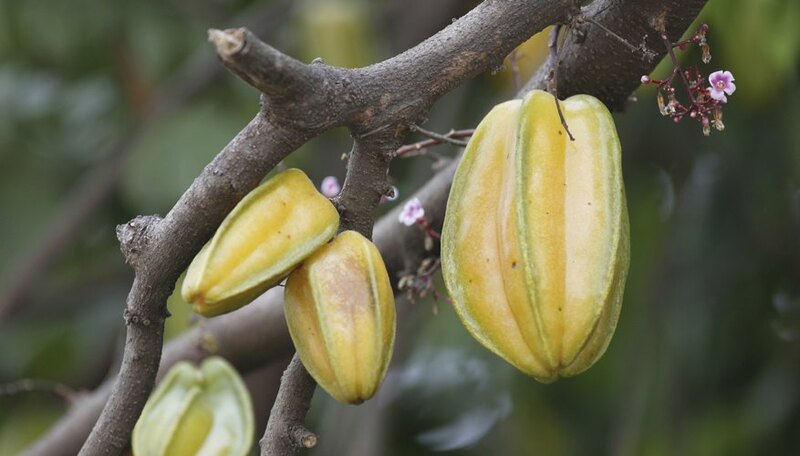 Carambola trees originated in southeastern Asia, where they are now extinct in the wild. They are adapted to warm, humid environments and will not perform well in areas where freezing temperatures are common. Carambola trees grow best within U.S. Department of Agriculture plant hardiness zones 10 to 12, although they can be grown in pots and overwintered indoors in cooler areas. However, pot-grown carambola trees may have trouble bearing fruit if not kept under suitable conditions indoors and out. Shade, drought, wind and wet, alkaline soil all take a toll on carambola trees, causing decline and premature death. Choose a growing location in full sun with loamy, mildly acidic soil and fast drainage. Shelter carambola trees from strong, drying winds to prevent damage to the branches, foliage and fruit. Potted carambola trees need full sun and a pot larger than 3 gallons to perform well. When overwintering indoors, place the tree in a very bright, sunny room where temperatures stay reliably above 55 degrees Fahrenheit, and shield the tree from heater vents and drafts. Carambola trees need a steady supply of moisture year-round, although their needs vary according to the season. Water weekly if no rain falls for longer than two weeks. Provide 1 inch of water weekly in winter and 2 inches in summer. When watering, wet the soil in the top 6 to 15 inches. Potted carambola trees deplete their soil moisture quickly, so regular monitoring is best. Water when the soil dries on the surface or if the tree wilts. Add water until it trickles freely from the bottom of the pot. Carambola trees are heavy feeders and require regular fertilizer applications from early spring until autumn. A balanced, 10-10-10 or 15-15-15 analysis fertilizer enhanced with micronutrients works best, both for garden-grown and pot-grown carambolas. Young, garden-grown specimens need roughly 1/4-pound of fertilizer every month, while older trees need at least 1 pound of fertilizer three times throughout the growing season. Pot-grown carambola trees also need regular feeding because they deplete their soil much faster. Apply 2 to 3 tablespoons of 10-10-10 or 15-15-15 analysis fertilizer every week, always to wet soil. As with many fruit trees, carambolas need all the help they can get to produce an abundant fruit crop. Garden-grown specimens must be planted at least 20 to 30 feet away from other trees and structures to prevent shading, a factor that prevents proper fruiting. Potted carambolas need to be outdoors during the warm summer months to allow insects to pollinate their fragrant, 1/4-inch-wide flowers. Also, place the tree near other plants frequented by pollinators to make them more visible.